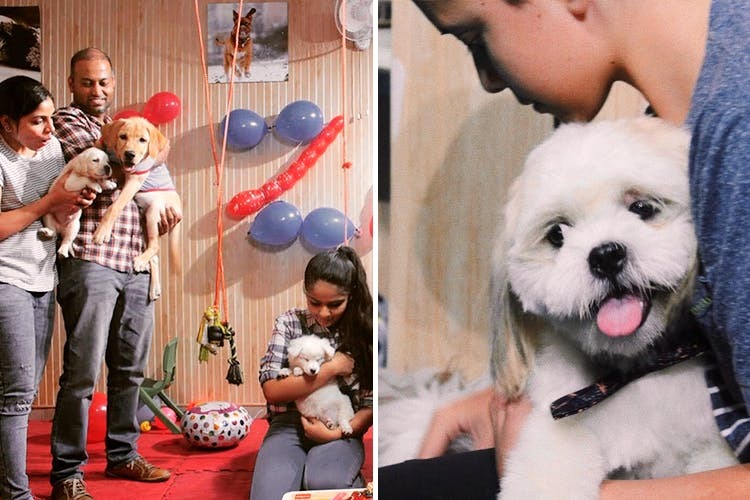 This new pet cafe is giving us a reason to go to Ghaziabad. With a pet cafe, store, spa, birthday celebrations and pet play time, this place is paradise for pets and their owners. Pet Street in Ghaziabad is just the place to take your pet for a fun play date. They’ve already been celebrating a lot of doggy birthdays, and it’s one of the many things about it that caught our eye. What we especially liked about it is the fact that they’ve got so many things for you and your pet to do. Even if you don’t have a pet, they have a bunch of in-house puppies and dogs you can go and play with during their ‘puppy playtime’. They have a pet spa and a jacuzzi, so you can take your dog or cat to be pampered and fluffed if they’ve had a ‘ruff’ day. They also have an in-house clinic, in case your pet falls sick, or you want to get a check-up done for them. They have a special play area, which you can rent for periods of up to 40 minutes of play time with your pet. This especially helps people who don’t have a lot of space at home, or want their dogs to play with other dogs. After you’re done with play time, you can head over to their pet cafe for a bite. They’ve got menus for pets and humans, and you can sip on one of their cold shakes and munch on some fries while your pet enjoys one of their chicken and rice bowls, or their pet-friendly cookies. They do some really nice customised cakes for your pets birthday – just look how nicely they do up the whole place! As for their pet boarding, your pet will be in safe hands in their air-conditioned rooms. They make sure your pet’s needs are taken care of, and the in-house clinic is always there in case they’re feeling under the weather. You can shop at their store for pet food, toys and more. They seriously have everything under one roof. Ghaziabad is seriously stepping things up with all their pet cafes. This is just such a nice place to go to for a date with your pet, or to just go and play with cute puppers. Check out their Instagram and Facebook page.